Itch to Stitch is 4 years old! I am not good at celebrations, I am used to keeping my head down and work. But this is worth some celebration! Itch to Stitch turns 4 years old today! AND, our little Itch to Stitch Facebook group just reached 10000 members! PLUS, Itch to Stitch now has 50 patterns. A celebration is really a way for me to tell you how much I appreciate all of your support and patronage! 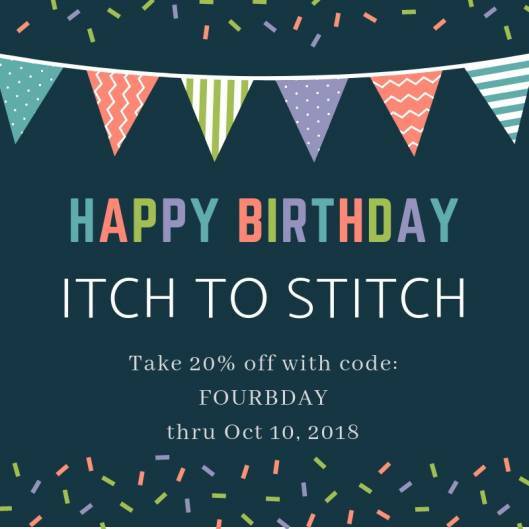 From now through October 10th, 2018, take 20% off any pattern with the code FOURBDAY. Be sure to enter for a chance to win of the two prize packs! Happy birthday its!!! I tried to enter the giveaway and checked off all 13 requirements but there’s no submit button and I tried to hit the check mark but it doesn’t do anything. Help please I would love a chance to win these packs!! Hi Shannon, maybe you can go directly to Rafflecopter and enter from there: http://www.rafflecopter.com/rafl/display/54c2f8c09/? Thank you for your response Kennis! I tried and I still don’t see a submit button anywhere everything is in great own because it’s all checked off I said check mark at the top but it doesn’t do anything when I click on it. If you checked each individual one, then I think you’ve already entered. There’s not a single submit button for all of them. Hmm, tried hat, still doesn’t work. You have entered. I see all 13 of your entries. There is no single submit button. You click on one individual, you already entered for that one. Congratulations on your 4 year anniversary! That’s a wonderful accomplishment and we’ll deserved…your patterns are beautiful! Happy Birthday! You’ve made so many great patterns over the last 4 years, I look forward to more!!! Happy Birthday ! and thanks for the great giveaway. Happy Birthday!! Thanks for the chance to win some great prizes. Happy Happy Birthday! How exciting to have 50 patterns! In four years! Great work designer friend. I can’t wait for what is next. I’m a big fan Kennis! Happy birthday, and thank you for the coupon! I’ve sewn at least a dozen Bonn shirts — it’s perfect for my lifestyle. Love your patterns! Happy Birthday! Happy birthday, Kennis! Your patterns make a great capsule wardrobe and are the best fitting. Yay for four years????! Happy birthday, Itch to Stitch! Thank you, Kennis, for such wonderful patterns and a wonderful experience overall. Your work truly makes sewing a joy. Happy birthday and thank you for some great patterns. Your patterns are the best! Happy anniversary. I have 7 of your patterns and have made several Uvita’s (which I love). I need to get on the stick and start making a dent in my fabric stash! How do you enter the birthday giveawsy? Hi Tina, you see the Rafflecopter widget at the bottom of the post? It asks you to do certain tasks (such as joining a Facebook group of the sponsor’s), and when you are done, you click on Submit, then you get one chance for there giveaway. There are more than 10 entries you can make (more than 10 tasks). Hope you enjoy this birthday, here’s to many more. ? How wonderful! congrats on 4 years of success! So glad you are thriving at 4? I am happy to hear that you enjoy the patterns. It’s encouraging to hear and I hope to make more patterns for everyone! Happy Birthday and Congratulations!! Love your patterns. Happy birthday! I love your patterns. I am not familiar with a few of the companies above and I am excited to learn more about them. Thanks for the celebration & raffle! I am glad to introduce you to some new designers!